LLC “SPC “PHARMASOFT” announces registration of a new dosage of the drug Mexidol® – Mexidol® FORTE 250, film-coated tablets, 250 mg, RU No. LP-004831 of April 26, 2018. “Mexidol® FORTE 250″ is a double dosage of the active ingredient in one film-coated tablet for patients who require an increased dosage, including patients with combined pathology. “Mexidol® FORTE 250″ is a reference (original) preparation of ethylmethylhydroxypyridine succinate, the only preparation with active substance ethylmethylhydroxypyridine succinate with a double dosage. “Mexidol® FORTE 250″ – a high safety profile. 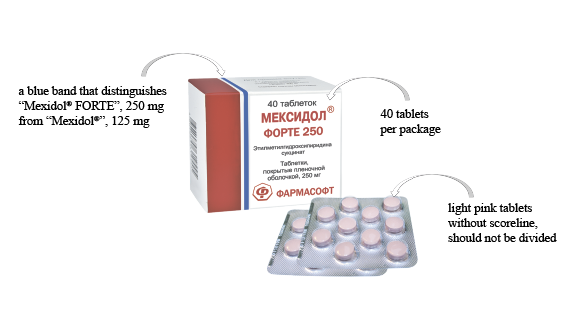 Presentation of the preparation “Mexidol® FORTE 250″ to broad medical community was within the framework of the Xth International Congress “Neurorehabilitation 2018”, which was held on May 31 – June 01, 2018 in the building of the Mayor’s office of the Moscow Government at the address: Novy Arbat str., 36, at the Simposium “Peculiarities of Management & Rehabilitation of Patients with Comorbid Vascular Diseases”, June 01, 9:00-10:30, Sector C.